EcoScapes works closely with clients through all stages of the landscape design, construction and maintenance processes to establish and sustain the landscape. Learn more about each aspect of our company in select service pages, and browse the portfolios to see striking images of our work. Do you want to conserve and harvest water? Let us tell you about Ferrocement water tanks. 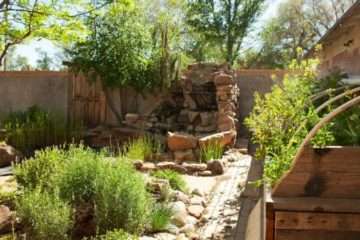 EcoScapes of Santa Fe was founded in 2001 with an inspiration to create a full-service landscaping company that designs, builds, and maintains beautiful landscapes, while remaining mindful of the local ecology and limited water resources. 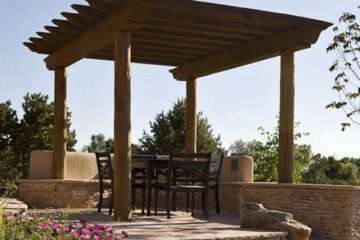 Our work is influenced by a love for New Mexico and its unique climate and architectural styles. Through observation and experience, the valleys and foothills around Santa Fe speak to us with their distinct needs and sensitivities. Whether reviving an established garden or commencing a design on a newly completed building, we make an effort to fully understand the land, the plants and our client’s needs. We are committed to conserving and rejuvenating the natural environment and creating spaces that fulfill the human spirit. From design through installation, Michael, Peggy, and the crew did a very nice job. We've received many compliments from neighbors and strangers alike. EcoScapes also maintains our landscaping, keeping it looking great! Thanks to EcoScapes team we are enjoying our beautifully refreshed courtyard garden. They "listened" to our objectives and gave us a visually pleasing yet minimal maintenance design. From initial consult to completed re-landscaping their team was on time, on budget, courteous and professional. Their helpful tips on pruning and watering will keep us on track for the care and feeding of a happy garden. Had a wonderful experience with EcoScapes! Began last fall with the landscape designer, Peggy, drawing up a master plan for our yard. She is talented, knowledgeable, and very easy to work with. 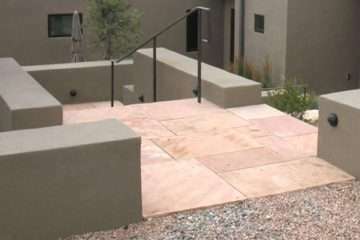 We then worked with Michael and his team to construct a large paverstone patio, irrigation installation, and moss rock walls, planting beds, and steps. They were hardworking and reliable and the work looks great. They have come immediately out to fix a couple small aesthetic issues. We look forward to working with them this spring for all of our plantings!